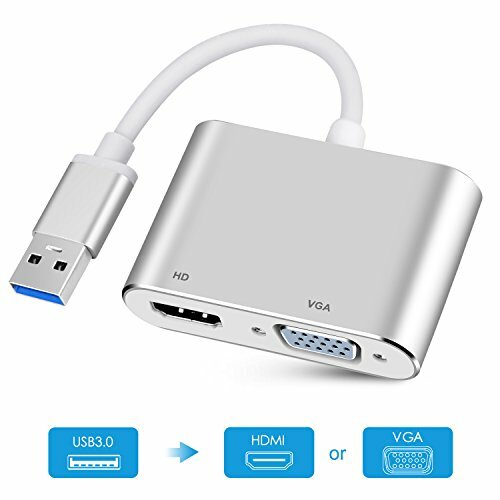 ❤ LC-dolida USB 3.0 to HDMI/VGA Dual Display adapter can connect a computer via USB interface to HDTV, monitor, or projector with HDMI and VGA interface. -Simple installation in USB 3.0 adapter, following the instruction guide to install, Don't need to Extend CD devices. -A good chipset ensures superior performance and long life of the adapter. ❤HOW TO INSTALL THE DRIVER? Pls try to install its internal driver directly. After plugging it into your computer, you will see there is a new USB device folder in your computer, then double clicks to install the driver. ❤ HOW TO SOLVE IF DOES'T WORK? 1.It's better to turn off anti-virus software and low down the firewall level before installing the driver. You can turn on them after installation. It takes about 6-10 seconds to mirroring from PC to TV after you get everything ready. 2.If found it can't convert picture well, pls check if plug the adapter on a USB3.0 port of your computer or not? And check the HDMI extend cable version you using, the HDMI version at least be V1.3 or higher, or it can support high resolution data transmission. 3.If you use two different brand display monitor output ,please follow this steps :1: Plug in HDMI port first 2: Connect USB port unless the screen appear normal 3: Plug in VGA in finally. 【USB3.0 to HDMI/VGA Dual Output Adapter】USB 3.0 adapter support HDMI & VGA ports to work Simultaneously, to implement the synchronization and extend display,convenient for you to do work/entertain at two different external displays,which is super practical for meeting and family entertainment. 【Not Plug and Play】 Our USB 3.0 to HDMI adaptor need to install the driver,it will promote a driver automatically when connected, then you only take a few seconds to follow the step and install.Do not need repeated installation, simply to use. (steps:after plugging it into your computer, you will see there is a new USB device folder on your computer, then open it and double click to install the driver). 【5 Gbps Super Speed USB 3.0】 Make use of the high-bandwidth (5 Gbps) SuperSpeed USB 3.0 interface. And also compatible with USB 2.0. Support for hot-pluggable devices(Only USB 3.0 interface can achieve resolution up to 1920x1080 p, if use USB 2.0 port,just can be 800 x 600p). 【Lightweight and Portable】 Portable USB3.0 adapter is lightweight to carry into your laptop bag on a business trip.You can extend the computer screen to a large screen display or projector, set up duplication (mirroring), use it for presentation with a projector etc, work in a large screen workspace, or use USB to VGA adapter to mirror display movies in the classroom. Support for Windows7/8/10】 The USB 3.0 Converter can't support Window VISTA and MAC OSX system. Just be used for Windows7/8/10. If you cannot get it work with the internal driver in the device, please manual download the newest driver(URL:https://support.frescologic.com/portal/home). Any problem, please feel free to contact us. We will try our best to make you feel 100% satisfied.